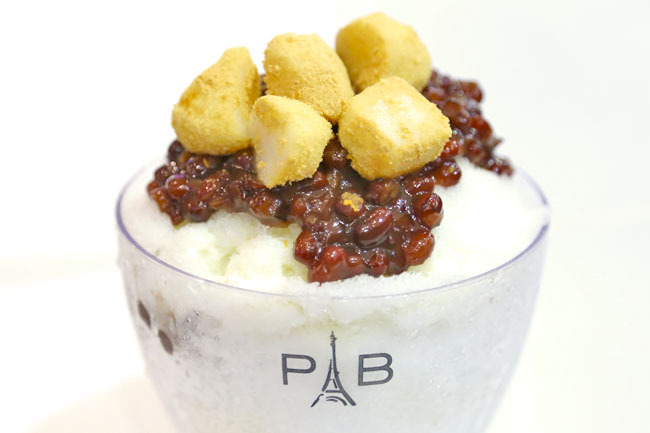 [Updated Aug 2015] Best Korean Bingsu in Singapore? Not really. This describes our love story with 17 different bingsu found in Singapore. 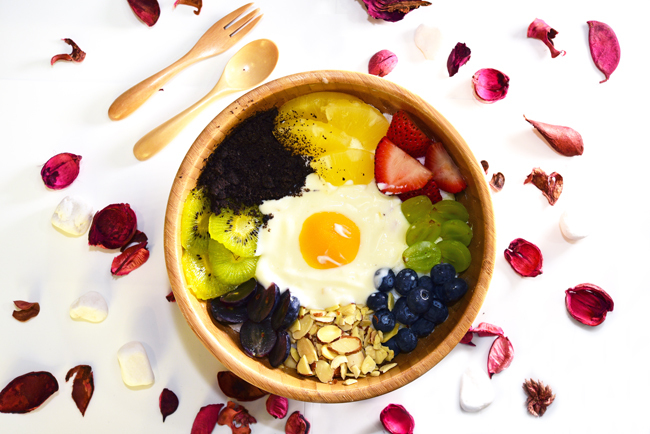 We say “Saranghae” to Bingsu 빙수, which is a popular dessert in Korean comprising of ice shavings and various ingredients, usually sweetened condensed milk, fruits, Korean rice cake, cereal flakes and ice cream. 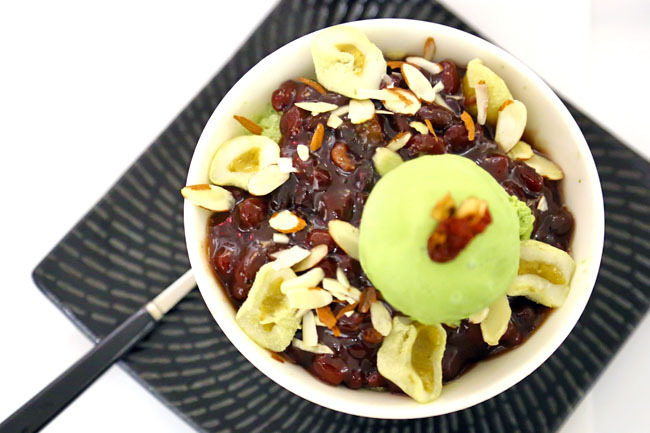 Of course, the Patbingsu 팥빙수 is our favourite, topped with sweetened azuki red beans, which you can let the smooth ice flakes slowly melt in your mouth, and your heart. 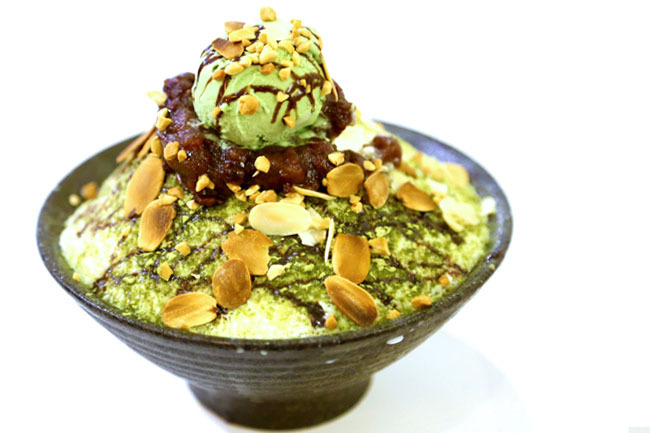 Nunsongyee, we would like to declare you “The Queen of Bingsu”. You were hard to find, located at an ulu spot of Burghley. Even if we drive here, we need to travel big rounds. Your name “Nunsongyee 눈송이” (pronounced as noon-song-yi) means “Snowflake” in Korean. So delicate. 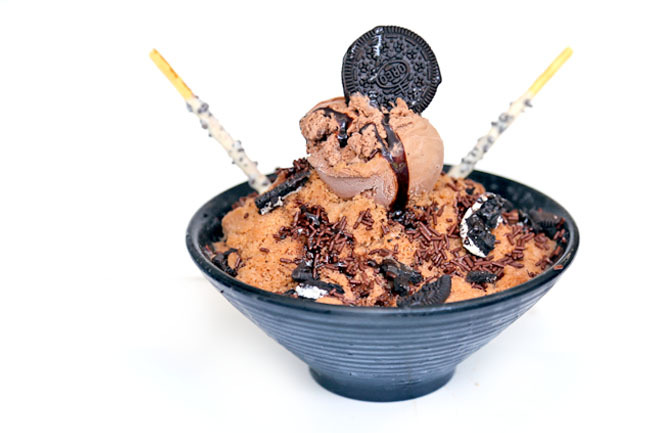 Your signature desserts of Snow Flake Black Sesame, Strawberry, Coffee Bingsu ($18.90), are also one of the priciest around. There are many toppings of powdered soybean korean rice cakes, sesame powder and almond flakes. So pure, white, soft and pillowy. ‘Nunsaram’ means ‘snowman’ in Korean. We tried your milk shavings several times. Sometimes you were very good, on others you were just good. So, your specialties are the Injeolmi Bingsu (S$12.90), Black Sesami Bingsu (S$14.9), Sweet Potato Bingsu ($14.90) and Strawberry Bingsu (S$14.90). The Injeolmi was definitely our favourite, lightly roasted with slight fragrance. Accompanying nuts were actually crunchy (we say this because some of your competitors use nuts which taste stale and ‘lao-hong’. Mother’s spoon. The smoothness of your milk shavings alone were Number 2 in our opinion – soft yet instantaneous melt-in-your-mouth effect. 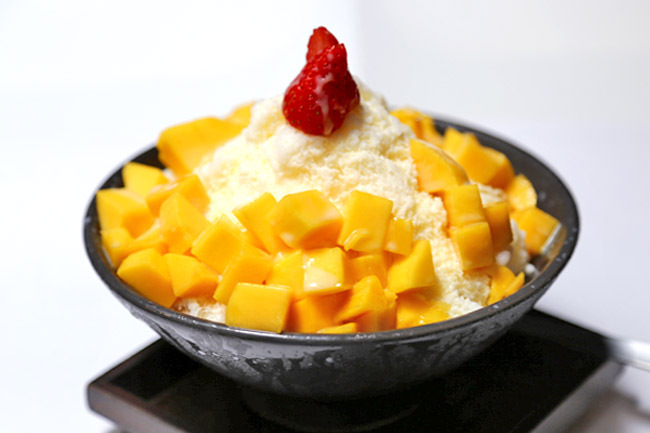 The best tasting bingsu is definitely the Mango Berry Cheesecake ($18.80). You know, mango cheesecake plus ice cream plus shaved milk makes us all happy people. But some of your bingsu such as the Injoelmi ($11.90) was rather flat-tasting, and the ice cream scoops on the others can be rather inconsistent and well, small in portion. Just saying. We were here for Ssiksin Korean Fried Chicken, and you were at the same place too. Wah, we spotted a specially imported MILK snow bingsu machine that apparently cost a 5-figure sum. While Nunsongyee used to be the only bingsu shop which uses a similar machine, we are starting to see more Korean cafes relying on that technology. Many of our female friends cannot decide if they like the Korean fried chicken, bingsu, or the cute Korean twins chefs best. Maybe all 3. Hearts may melt before the bingsu. 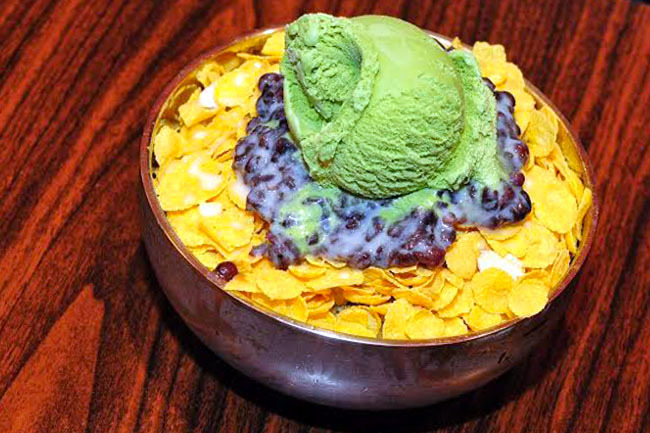 Anyway, the bingsoo has become bigger with a larger variety (they used to sell a mini size). 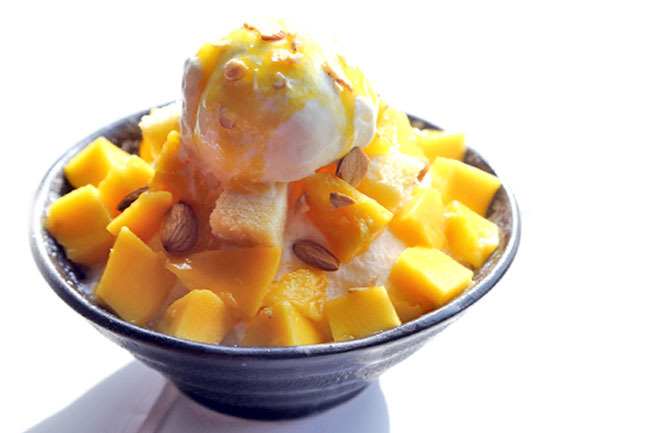 The Mango Snow Bingsoo ($12) had a fluffy fine texture, though we thought that more ingredients could help pump up the taste level. Your Injeolmi (Korean rice cake), and Milk & Red Bean Bingsu ($10) were filled with so much love. The ice was quite fine (though not as smooth as the newer places), topped with crunchy ingredients of as corn flakes, sliced almonds, walnuts, cashew nuts. Container cafes are common place in Korea, where shops are set up in cargo-converted containers. We were surprised to find a container café in Singapore, though you were quite hard to locate. The Chocoreo Bingsu ($13.90) aesthetically photogenic with OREO crumbs and Pepero sticks, was smooth, but gravely lacking in flavours. My friend quipped, “Without the cookies and ice cream… no taste.” But at least the shavings were still smooth. We got tricked. This is not a bibimbap, but a BiBim ($18) remodelled like a real bibimbap (Korean mixed rice) using fruits of various colours as toppings instead. The egg yolk was created using a slice of mango whereas the egg white was made from yogurt. Sp pretty yah? Didn’t feel like stirring everything together (and mess things up). Sadly, the shaved ice turned out to be pretty bland like snow, without using similar shaved milk found in other Korean bingsu cafes. Your bingsu was as authentic as it could get, with flavours of Green Tea and Red Bean ($11.90), Mango ($10.90), Taro ($9.90), Yogurt Cheesecake ($12.90) and Milk Tea ($10.90). Good, affordable, thirst-quenching, and we liked your red bean. Where did you get them from? Hello Café Insadong, your female standee at the door looked scary at night. But anyway, we also liked your Patbingsu Ice (‘pat’ means ‘red bean’), in flavours of Red Bean, Sweet Potato, Oreo, Mango, Green Tea ($8.50 – $9.00). We hear that you are a local start-up, with staff trained by a Korean dessert chef. For your price, we were surprised by the generosity of the ingredients – a full scoop of ice cream, a glob of red bean on the side, some crunchy almond slices, sliced red dates, and as you dig in further… sweet sticky Korean chapssaltteok (rice cake). Quite dae bak! 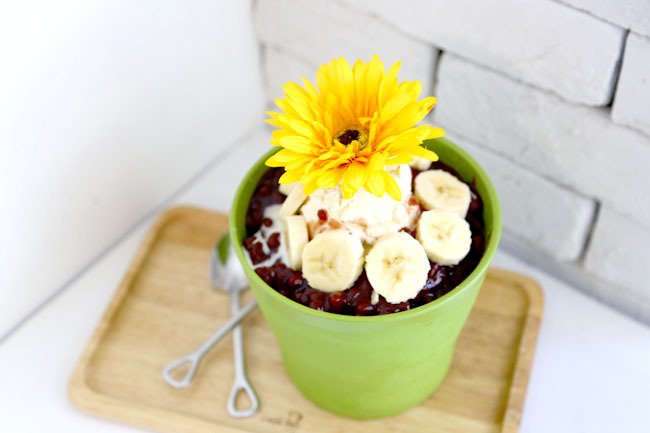 If there is a beauty pageant for Korean bingsu, Banana Tree’s Pot BingSoo ($12.50) would emerge champions for “Miss Bingsu Singapore” and “Miss Congeniality”. Trust us. Coming in a flower pot with a big round scoop of Häagen-Dazs ice cream, we loved the sweet red bean, but thought that the iced shavings were rough. Yes, rough. But, we just heard you are getting a new bingsu machine. When would that be? We ventured to Resorts World Sentosa for your sake. Insadong Korea Town, your self-ordering concept is very different. I got slightly lost the first time, but much better the second round. 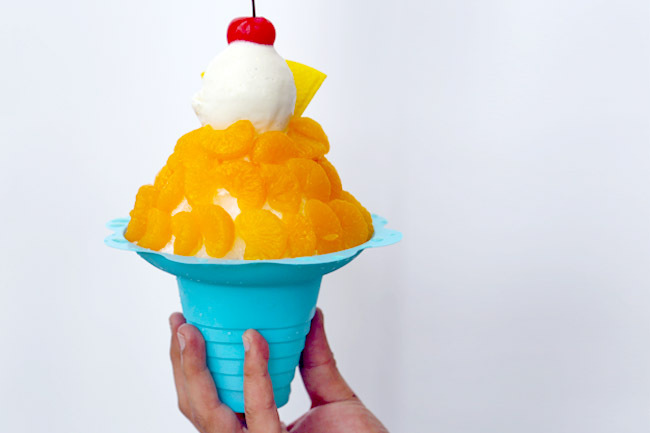 Your Mango Shaved Iced with Ice Cream ($10) is topped with many ingredients and fruits, a little sweet for us, but we figured kids would like it. One of the most affordable Korean Patbingsu around, you make several mummies (and daddies) plus children happy. For $6.80 and a huge portion, we cannot complain much lah. Talking about children, so many of them playing around in your café. I see, you are a Korean kids cafe located in Bukit Timah Shopping Centre. 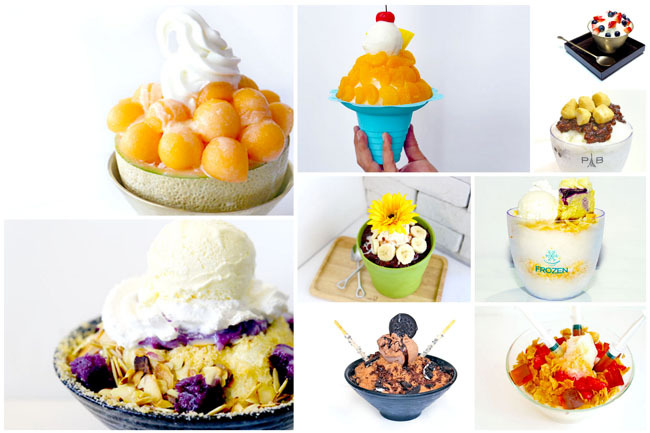 Hot-sellers include Patbingsu (Red bean shaved ice), Raspberry Bingsu (Korean raspberry shaved ice) and Korean style waffles (Ice cream, fruits and plain). 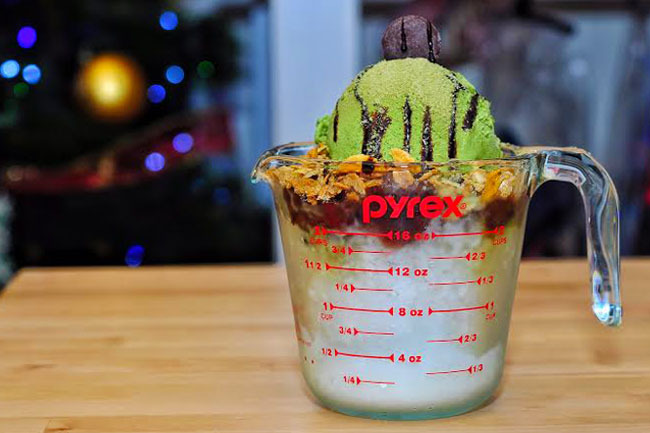 Your Matcha Patbingsu ($8) in a huge pyrex apparatus was cute. Paris Baguette, the first time we tried your shaved iced, there was no Korean rice cake on top. Then we went to the Raffles Place branch, and there wasn’t this dessert item. Aiyah. We were determined, so went back Wisma again. Ah, we liked the first few mouthfuls. The ice quite fine, and red bean sweet and satisfying. Then we couldn’t help but give up after a while because there were just red bean, red bean and red bean. Chick and Ken, you win! 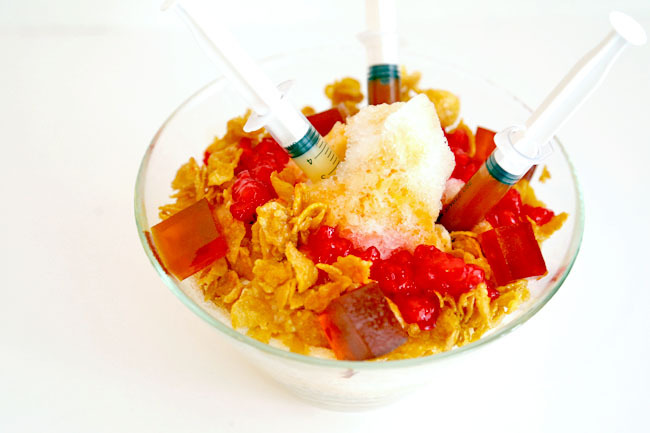 Syringes with your bingsu? Is a doctor around? 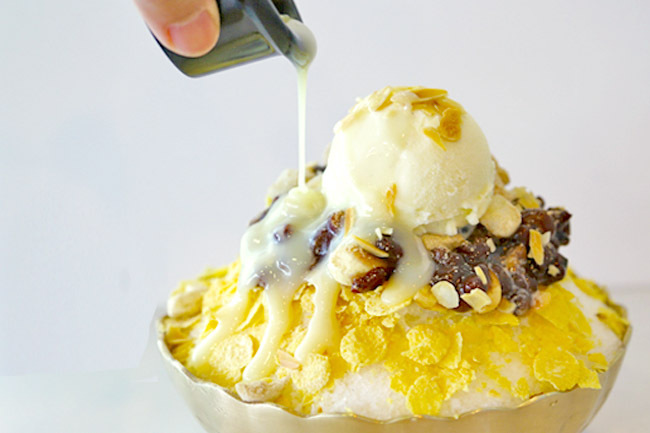 Thai inspired Cha-Yen Bingsu ($12.90)? Annyeong Sawadee? 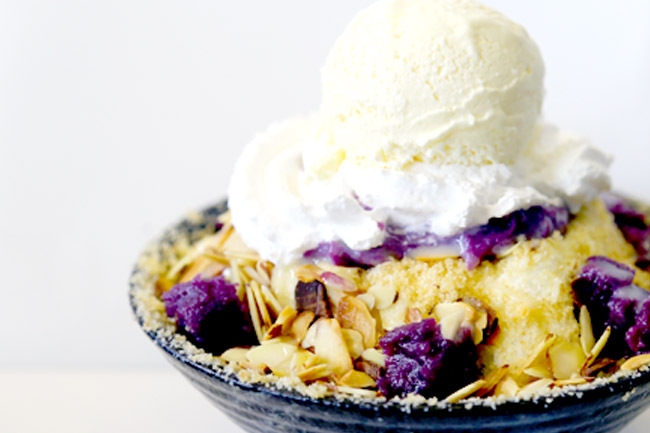 Ok okay, we admit – your Bingsu fared somewhere in the middle – not the best, not our worst. We had fun squeezing the condensed milk and syrups out of the syringes, but can you (I mean your ice) be finer? Don’t be so rough. The Korean (bingsu) are not that rough. Your bingsu left us frozen. 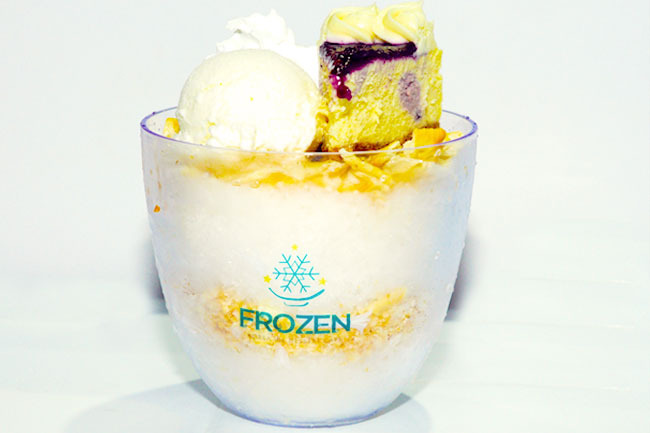 The Elsa Blueberry Cheesecake ice flakes ($17.90… wait, why so expensive?) looked pretty, coming in a slice of cheesecake and milky ice cream on top. 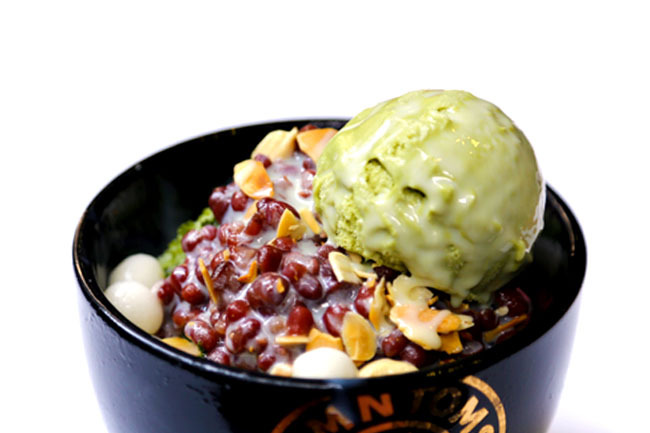 May I enquire between nunsaram and toms which has better bingsu ? Thank you ! Nunsaram has the better machine (I think) so it is smoother. I like Tom’s ingredients. 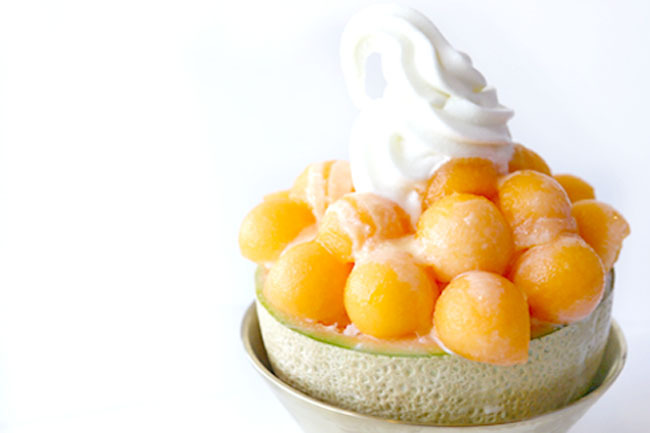 i think you can try snowy village’s matcha bingsu or pineapple bingsu. They were tasty. I went there with some of my friends and tried few bingsu and sides.. overall not bad lor. Thanks for this amazing list! !